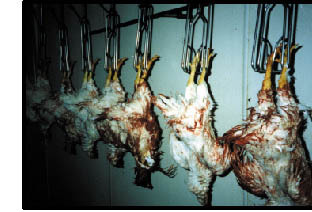 Tyson Foods is the biggest seller of chicken in the world. And in an industry that is known for severe labor violations, it could also be considered the worst. Chicken consumption has more than doubled in the United States over the past 20 years, and industry profits have risen more than 300 percent. But the prosperity the poultry industry is enjoying hasn't affected workers. Real wages for the approximately 250,000 poultry workers in the United States have remained stagnant over the past decade, with average earnings of $6.74 an hour. The industry is almost completely controlled by five major corporations, who set labor and wage standards with little fear of competition. ations of the Year" by Corporate Crime Reporter, based on seven worker deaths, fines from the Occupational Health and Safety Administration in several states, and other labor violations. busting and pulling out all the stops to fight its opponents. Many of its operations have been transferred to right-to-work states in the South in an attempt to avoid union organizing. Tyson workers each put in hundreds of hours of overtime a year, partly because they are not paid for the lengthy process of putting on, removing or cleaning their required protective gear. In June, 6,000 workers signed on to a lawsuit in Alabama charging Tyson with violations totaling at least $100 million a year in unpaid labor. This is nothing new: A recent Justice Department study showed that 100 percent of poultry corporations in the United States are guilty of wage and hour violations. Jill Cashen, spokeswoman for the United Food and Commercial Workers (UFCW) union, notes that at least 50,000 of Tyson's roughly 60,000 workers could be eligible to join the lawsuit.